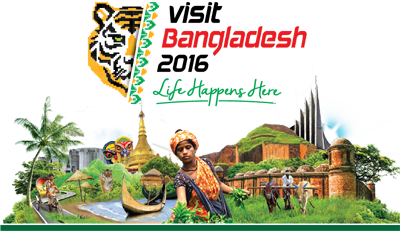 Travelers Add Tours - Special tour Bengali New Year Celebration in Dhaka, Pohela Boishakh tour. Experience the colorful Bengali New Year Celebration in Dhaka. This is one of the best festivals for the people of Bangladesh, one that you must experience at least once. You must enjoy the first day of the new Bengali year (called "Pohela Boishakh"). Increase your luck for the next year through celebrating in Dhaka! Bengali New Year is celebrated with a lot of fun and enthusiasm and is an occasion that everyone who comes to Bangladesh must experience at least once. Dhaka University, Ramna Park and Shahbagh are the central tourist attractions of Pohela Boishakh. On this tour, you will experience the colorful procession named Mongol Shovajatra, as well as visit the Bengal New Year fair and feast on special delicious food prepared for the celebration. This is one of those rare festivals where all the Bangladeshis, regardless of their religion, location and status, celebrate. Walking, rickshaw ride, etc. are very enjoyable in this day due to the festive mood everywhere.